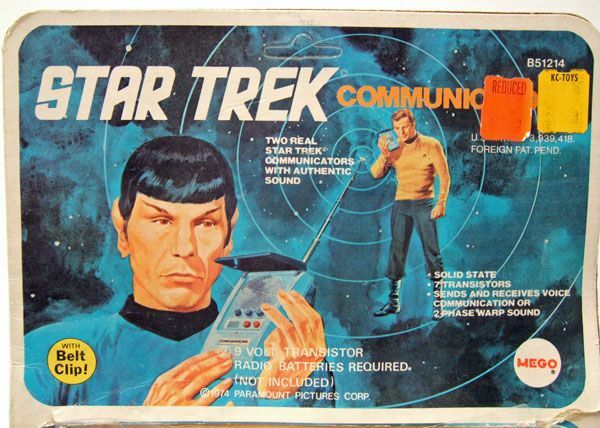 Mego released these communicators back in 1974! That's older than me! Captain, would you do me the great honor of reading "between the lines"? 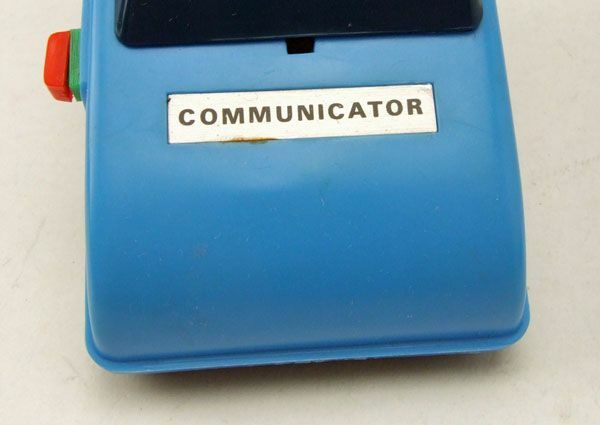 ... features a label letting you know that this is indeed a communicator. Just in case you forgot or something. With the press of a button, the upper lid flips open- revealing the inner area of the communicator. While there are obviously some liberties being taken here, the inside looks enough like a real communicator to satisfy a child's standards. There's a big silver speaker area standing in for the prop's moire, and an array of non-functioning buttons for you to not do anything with. 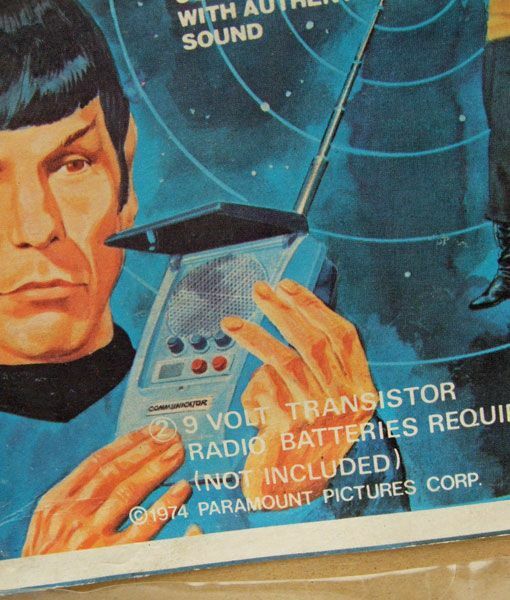 The communicator is operated via three interfaces along the side. The upper dial turns it on and controls the volume, the middle button allows you to talk, and the lower green/red button handles your "alert" signal. How's it all work? Glad you asked. Pop open the back of communicator and you'll see this. Yep, that's right... there isn't a dedicated battery compartment. When you open the back to slap in your 9-volt, you reveal all the internal workings of the comm. 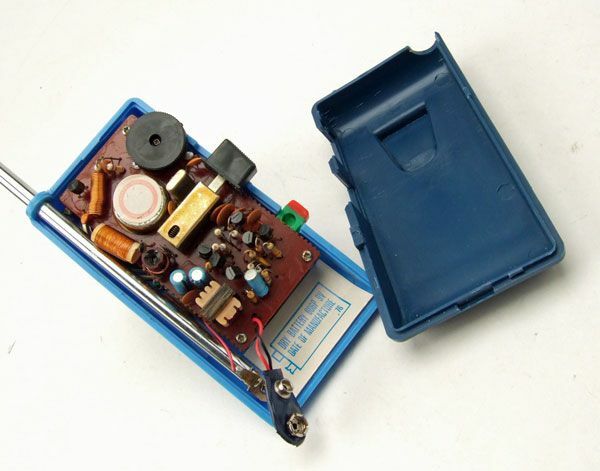 This was the 1970's... who needs a stinking battery compartment? 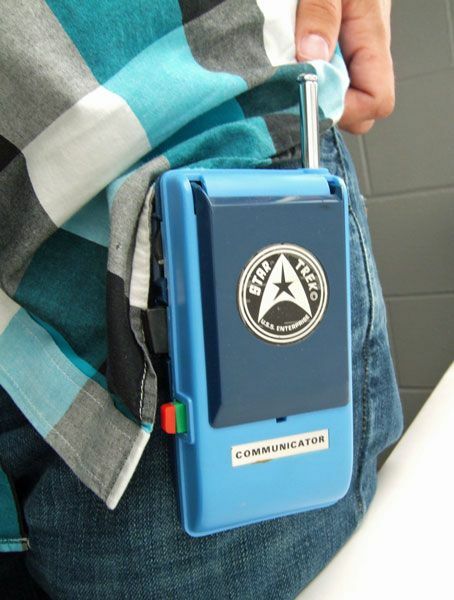 Inside the top portion of the communicator is the telescoping antenna that allows you to send and receive signals. It's ridiculously long when fully extended. Like over 28 inches long. I'm sure passing truckers just loved listening to kids playing on these things. I don't think I need to give you a demo on using the voice feature, but the "alert" signals really need a listen. The alert is activated by depressing the lower red/ green button. Press it in just enough to hide the green area and you'll hear the "Green Alert Signal". If the poop has really hit the fan, go ahead and press it in all the way to activate the "Red (DANGER) Alert Signal"! Check it out, but I'm warning ya- It's loud! Yeah, that's not annoying at all. It's amazing how 25 years can change your perspective on toys. At 7, I'd have loved that sound. At 32, I want to throw this thing across a room until parts break off. And since Mego thought it was important enough to mention it in a blurb on the packaging, I should probably draw your attention to the belt clip. How else are you gonna carry these? In your hands? That's for losers. 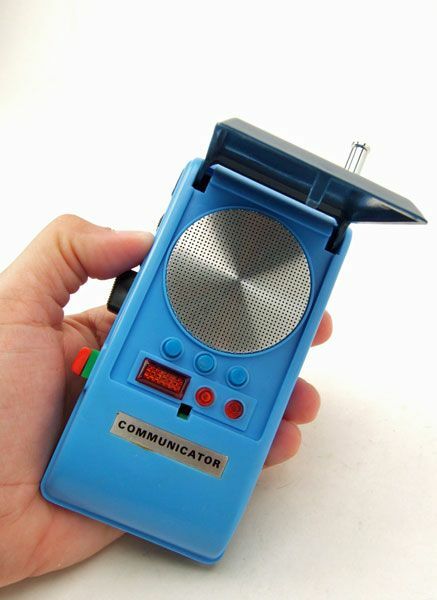 So there ya go... Yeah, there have been more accurate communicators made, but more fun? No way. I'd have LOVED playing with these as a kid. 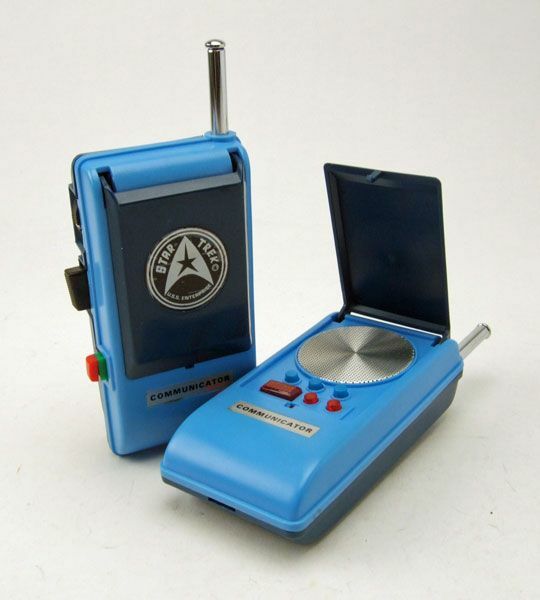 Walkie-talkies were my preferred method of talking to friends back then, so Trek versions would have been the bee's knees. Of course, those were simpler times... back before 9-year-olds carried cell phones. Man, I really miss the old days. Very cool blast from the past. Another great article and, indeed, a real blast from the past. I remember my best buddy in first grade had these and I was so jealous of him. This is what passed for high-tech coolness when I was a kid in the 70s. And I like the so-retro-it's-cool packaging art, too. The art for the communicator would make an awesom poster...! When you opened up the back, did you happen to find the "transtator," which as we all know is the basis of every important piece of Starfleet equipment? 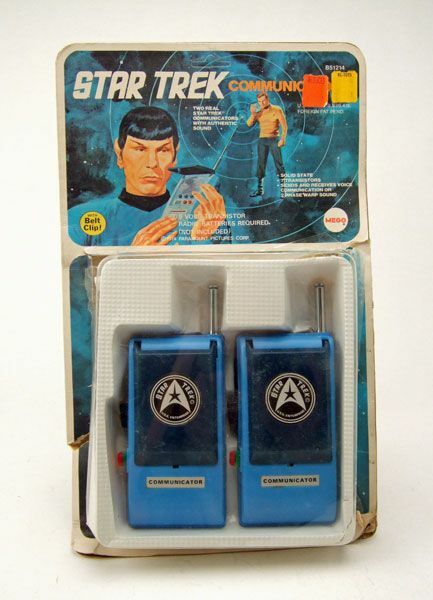 I would have killed to have those Communicator walkies as a kid. 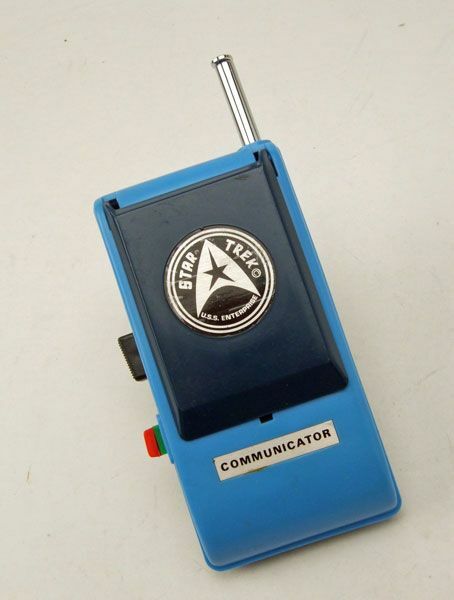 if i just have one communicator left, no box...would it be worth anything...still perfect condition!! still works with the orignal radio shack batt. in it.. I had those !!! Envy of the block, all the kids wanted to play with these. Of course, then, walkie-talkies were THE rage with kids. Also had the plastic (AMT?) 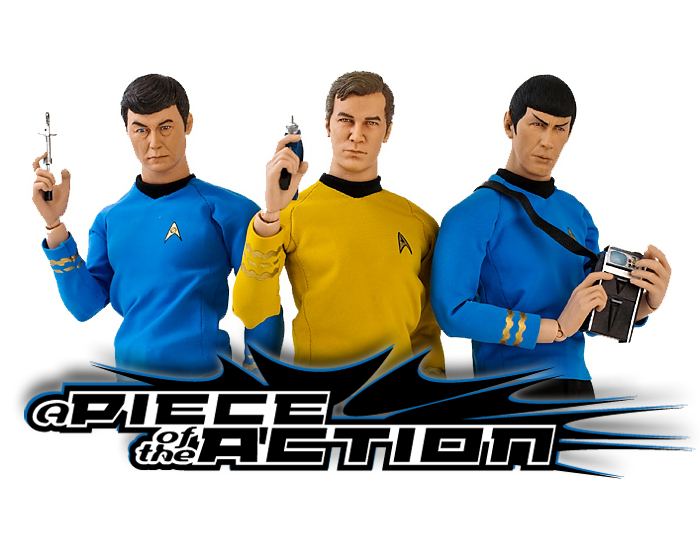 model kit of the cominicator (and phaser and tricorder... in one package!) Oh, the days. We miss you. Still got one of mine. I let a friend borrow the other one to repair a couple of resistors and never got it back. Long dead now. Wish I could find a lone one for sale. I had these as a kid... and it would not surprise me if I were to find them in a storage closet someplace at home.